I dunno worth a shot. Well, I have not seen any bandpictures yet... I did wonder about the entry in Tom's blog called 'The Nocturnal Vault'. Suddenly on his own MySpace or the Triptykon one, there is this Norman whose avatar is posted before Reeds, and he seems to be a drummer.... Is the nocturnal vault about Reed, and is he already replaced by this Norman guy? Speculations, speculations.... Love to do it, but sometimes it's killing! Interestingly, Norman does not have Reed or V.Santura as a friend on MySpace. I'm not really sure that means, if anything. Afterall, most of the friends that I have on MySpace are on this board. Obviously, this is all speculation, but I think that the seductive conclusion we are all unwilling to give voice to is that Tom and Reed have parted ways, (cf. "The Nocturnal Vault") and Norman is now being considered for the job. Sometimes, I feel like I should get a dayjob. This business of reading tea leaves could drive me crazy. Could Norman be a fill in guy / drum tech assisting in Swiss based rehearsals? I h8 speculation .... but I hope that whatever tension there "may" be between WARRIOR/Reed can be resolved positively .. Losing either one right about now would be salt in the wound ... as I want to see/hear these two together again more than anything! Did you just say 'h8'? So until that changes I'm just going to assume nothing has changed. I'm not sure if someone pointed it out in the past (I get the feeling someone did), but Tom's return to using "Warrior" is pretty interesting. I wonder what symbolism one can look into this with, such as his feelings on the music being more expressive of "WARRIOR", as opposed to "FISCHER". I want those days back .... with a vengeance! 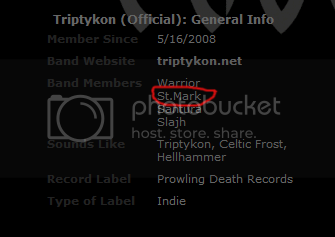 Recently five new pictures were added to the Triptykon Myspace, so if Reed was out of the band, it would have been changed. I guess that there are other forces at work here.